What is thinking? This is it. 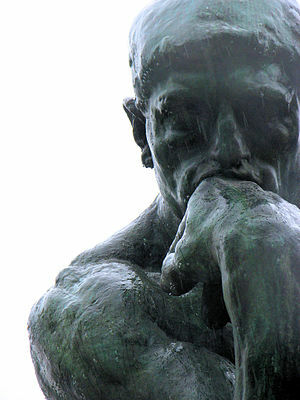 One single, simple Question: what is thinking? This is it. This is where it is all about. Later or better, sooner you will stumble on the process of thinking. Whether you want to get rid of it, or to make this tool perfect to work , it will accompany you at every step in your life. Its is the core business on your path to self-realisation. It keeps you running like a restless tramp. It is like chasing your shadow every second of your journey. Thought is Idea. Idea is Thought. You are Idea. Idea is You. This means when we want to understand definitely who we fundamentally are, we will always need to realise this body-mind structure is part of the circle. It is like air. Fill up a balloon with air and suddenly you give shape to air. Or better, air gives shape to the balloon. No air; no filled balloon. Q: I experience my thinking like a roadblock on my path to self-realisation. How can I get more control over it? A: Do you want to get rid of it, or do you want to make it perfect? Q: I want to perfect it, including more control. For my work I have to think a lot. Now I just want to stop the endless stream of thoughts when I am not using my Thinking. Meditation helps me somehow, but after a while I notice it is back on an endless track. A: You make (non-active) Thinking into an enemy, that need to be controlled. You want to keep it silent and clean in your head. In your brains you have billions and billions of connections leading up to thoughts, or better called Identifications. Although scientists made up pretty impressive investigations on our brain, it never made them stop endless thinking. I agree that meditation can give you a lot of comfort, but it is not the way to handle non-active thinking. A: Sit down and relax: observe your body and its functions, its senses, the objects around you, the stream of thoughts, feelings, everything you notice. Last but not least you observe the observer. Include everything. Now overlook your Kingdom. Realise yourself now, this all belongs to the world of Thinking. Everything is all ‘Thought’. Perhaps now it becomes clear to you that sometimes you jump on a ‘flow’ of thoughts, but not all the time. It is up to you. Try it. Jump on a thought, perhaps it is something minor: the Smalltalk you had with a friend before you came to meet me, or there is currently a problem in your life that asks for your attention. You might start to worry, you mix emotions and thoughts. They are one of a kind and connected. In fact they are one and the same. Go into this mix of emotions and thoughts. Fill up your train. And now let it rail away. In the middle of the stream of thoughts you will notice silence. Well, it looks like silence. Of course you love that moment of peace. Specially when life demands a lot of you. You relax. To be honest if you look carefully, even in the deepest moments of your meditation, there is still a tiny stream left. It is far away in a distance, but still it is there. In fact it is not there. You think it is there. So now it is there again. Understand this! Q: So this means I can’t bring thinking under control? A: No, you can’t. THIS EXISTENCE, EVERYTHING INCLUDED IS BUILD IN THOUGHT, AN IDEA ! You ask water to give up its wetness. You ask air to stop its flow. Thought is air. Fill up a balloon and air gets form. Better, air gives the balloon its full shape. Pierce the balloon and gone is your form and air. So the only way you understand the origin of thought is to realise that everything you are aware of, body, feelings, thoughts itself, objects is form made of air. Thought is air. Air has no form of its own. It can only show form when it is Identified into objects. Read this sentence over and over and try to understand it. Visualise everything around you in this room, including your thoughts and feelings. Do it again when you are home again. Where is this current room left? It has gone. It is not there. Q: I could come back to your place? A: You can, but then where is your home left? Don’t start to mix this relative reality with the deeper meaning of thought. Perhaps it is hard to understand this part of my answer, but you build your life every second. Even faster. You even made a reality-pattern. You call it the awakening-state. Q: So this means I can’t leave this circle? When my body dies I might leave it? A; The body will die one day, yes. With the body its brain, its senses. The body will be given up like a pierced balloon. But hey, where the air will be left? In fact you have filled a balloon. One big balloon and inside this balloon you ask the balloon to stop ballooning!